First, before everything else I want to say that my experience with Runescape is around 2 hours so there will be no comparison to characters from there, lore, places from the game etc. Card Collecting games are seeing huge resurgence and that is no secret for anyone. Hearthstone is still huge, not to mention how many more came after it. Some of them good, some bad, but that's how always it is. After Hearthstone though every CCG was proclaimed to be clone of Blizzard's hit. When information came that Chronicles: Runescape Legends which is Runescape's CCG is going to be released the same was said for it too and to be honest it looked like one. But oh my how wrong we were, because this has very little to do with Hearthstone or any other card game. In Chronicles you and your opponent go through five levels, on which you fight monsters, buy items, get money. There are two important things to mention - first you do not fight the same monsters so this is not co-operative game. Second you choose what monsters to fight and when by playing them from your hand. Yes, that's right! Essentially you are building the encounters on each floor or level by playing cards from your hand. As I mentioned cards are not only monsters they can be helpers, or weapons, healing items, money or even spells. Basically your idea is to build your character by increasing his attack and armour for which you will need money from helpers and monsters. And at the same time if opportunity presents itself to weaken or even kill your opponent. The moment one of you is dead the match is over. If after the end of the last floor both of you are alive you fight until there is only one. Battles with both monsters and opponent happen the same way - you just smack each other and the tougher guy wins. Despite this there is good variety of tactics based on the character you are playing. Some will gain armour quickly and win by simply being tough as nails and by beating you to a pulp with their massive plates of armour. Others will collect money with ease and will buy items quickly, another will shower you with spells and so on you got the idea. The classes feel different, each with their own weaknesses and strengths. Each being able to be played aggressively or not depending on your preferences. You can go for the kill when you duel or you can try the cruel way and kill your opponent during the encounters, by playing different spells and monsters which allow you to strike the enemy. Chronicles will offer you 3 main ways to play which are the same as in any other CCG - Ladder, Dungeoneering (draft/Arena) and Singleplay. Also there are a lot of daily task to do when you log in so if you do not like to just climb the ladder you will have things to do. Boosters are sold for both real and in-game currency and also you will be rewarded cards and boosters when completing daily quests. Visually the game will remind you of Runescape. The battles are bit clunky looking as the characters (Legends) are made like figures. This is something I hope they change at some point as it will make the game a bit more enjoyable to watch by the ones who are playing it. Although I must say that this gives the game this boardgame feel. Interesting idea is to make you see across the board the character of your opponent in humanlike size sitting against you and watching the game and even mimicking and reacting to things that happen. This also helps to recreate the feeling that you are sitting against someone and playing a boardgame. Chronicles is a lot more like a dungeon crawl mixed with card collecting and deckbuilding than a cardgame. 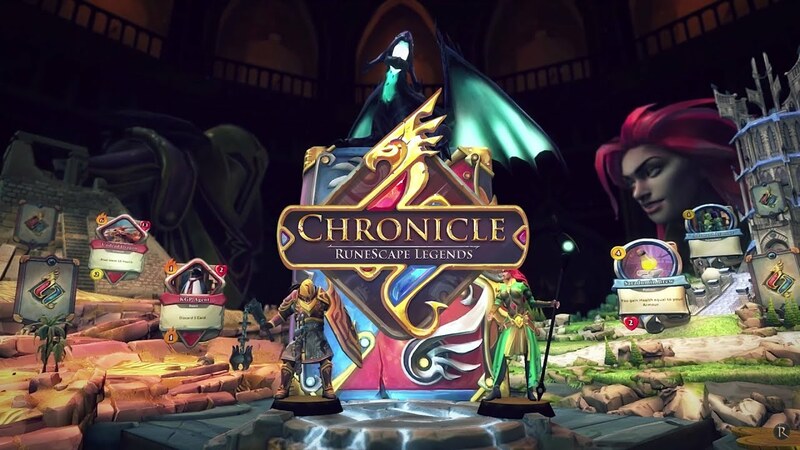 Chronicles: RuneScape Legends is one more game which is blending genres together but the difference is that this time two tabletop game are mixed - boardgame and CCG, making something unique and interesting. The greatest thing for me is that you do not need to know anything for RuneScape if you want to play the game and enjoy it. It also offers something unique to all fans of CCGs. Another thing which I noticed is that because you play your cards for your benefit somehow it feels that card collection size does not matter as much and starting decks feel more competitive capable than in other similar games. That said do not expect to reach the top of the ladder but you will have easier start once you grasp the game. Публикувано от Sharki в 12:37 ч.